Delta State Governor, Senator Dr Ifeanyi Okowa has urged students to imbibe the spirit of working hard to achieve results. The Governor made the call at the finals of the 2018 edition of Delta State Principal’s Cup, where Marvel International School, Ughelli, narrowly beat their opponent, St. Paul’s Secondary School, Ozoro in a penalty shootout to lift the trophy. Governor Okowa who presented the trophy to winners at the 25, 000 capacity stadium of Delta State Polytechnic, Ozoro, urged students to always know that hard work pays and should be serious with their studies. ­ He commended Zenith Bank for sponsoring the tournament, disclosing that Headmaster’s Cup had been instituted for primary school students. “We have instituted the Headmaster’s Cup so that we can discover them much younger so that they can know that they can play football as professionals,” the Governor said. He used the occasion which was witnessed by traditional rulers, religious leaders, among others to thank Isoko people for their peaceful dispositions. Winners and participants at the tournament went home with different cash and gift prizes while the Governor stated that schools that won in the tournament would be given school buses apart from the cash gifts. 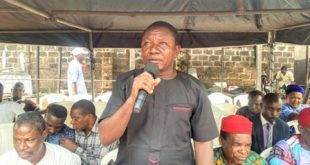 Chairman of Isoko North Local Government Council, Mr. Emmanuel Egbabor, in a welcome address, thanked Governor Okowa for approving that the finals of the championship be played in Ozoro, assuring that Isoko people would continue to support his government. At the end of 90 minutes of play both team scored 1 goal each prompting the game to go into a penalty shout-out which ended 7-6 in favour of Marvel International School, Ughelli.